Sports reporters often lead their newsrooms in activity on social media. That doesn’t mean they have to like it. By Joseph Lichterman @ylichterman June 16, 2014, 10 a.m. While the rise of the Internet has obviously impacted all corners of the journalism world, if you were ranking the most affected, sports reporters at newspapers would be high on the list. Passionate fan bases have more choices than ever — some well beyond a paper’s distribution area — from which to gobble up coverage of their favorite teams. Social media has allowed journalists to build personal brands and establish themselves as experts on the teams and sports they cover. The game story has lost importance to the small update or the smart analysis. Some have been made into stars by the new platform. But just because they tweet doesn’t mean they have to like it. Despite the promise of increased reach, there’s still a general disdain toward social media and the generation of online-first sports sites that has grown up over the past decade, according to an interesting (if admittedly small) study on the impact of trends in online publishing on newspaper sports journalists’ jobs. The paper — “Curmudgeons but Yet Adapters: Impact of Web 2.0 and Twitter on Newspaper Sports Journalists’ Jobs, Responsibilities, and Routines” — is a small window into some of the same newsroom culture issues that are playing out in other sections and on other desks. Kian and coauthor Ray Murray, also at Oklahoma State, interviewed 12 newspaper sports journalists at length — aged between 31 to 64, at papers of various sizes, on beats from prep sports to the big leagues, all around the country. Each of the participants was a well-established journalist with at least seven years of full-time newspaper experience. Each the journalists told Kian and Murray that they have Twitter accounts and use them for reporting. But there was a divide among how the journalists actually tweet and interact with people, the study found. Reporters at larger papers covering more high-profile beats are more likely to use Twitter more often. But the researchers found that the younger journalists felt more comfortable interacting with readers on Twitter. There’s a lot of animosity toward Deadspin and other blogs. For years, there was an established career path for newspaper reporters: You started at a small paper, probably on an unsexy beat, and gradually worked your way up to bigger beats at better papers. But that hierarchy has been thrown out of whack as people without a background at traditional news outlets work for places like Deadspin, SB Nation, or their own sports blogs. As you might imagine, the newspaper sports reporters aren’t big on that change. Kian cited sports sites’ willingness to cover stories or take approaches traditional outlets wouldn’t — like Deadspin’s story last year about former Notre Dame linebacker Manti T’eo and his nonexistent girlfriend, as well as Deadspin’s fondness for calling out other outlets. To be a blogger, you don’t need to write well. You don’t need to know any facts; you just need to put some words down. And there’s certainly no accountability. Some people could say “so and so is getting fired.” So if you get it wrong you can just write “we got bad information, it’s all good.” Unless the guy you reported wrongly about does anything about it, then you’re free to do whatever you wanna do. I love the First Amendment, but there probably needs to be somebody policing somehow of the Internet — at least for people who claim to be journalists. You want to get all the facts right. If I wanna know something about NHL [National Hockey League] free agency, I’m going to NHL.com or ESPN.com; I’m not going to “Billy Bob’s Hockey Blog.” I hate freaking bloggers. Breaking a story isn’t what it used to be. From talking to other guys who were on the [name of MLB franchise] beat in the 90s, they would wake up in the morning and have the terror of reading every other newspaper to see whatever you missed. I don’t have that feeling any more. Everything is broken on Twitter or online somewhere. You just don’t miss much. If you do get beat with something, you are beaten for 15 minutes and no one really notices. But due to the speed of Twitter, there is an outsized emphasis on getting information out quickly, and many of the journalists in the study felt like there was pressure to get information out as quickly as possible, even when they could’ve done more reporting for a story. When you find out news, you have to put it out there immediately somewhere. Whether your story is well formed or not now matters less. Twitter is the primary outlet that almost all of us [sports reporters] use for first reporting. and then you use the paper’s website for a short story. 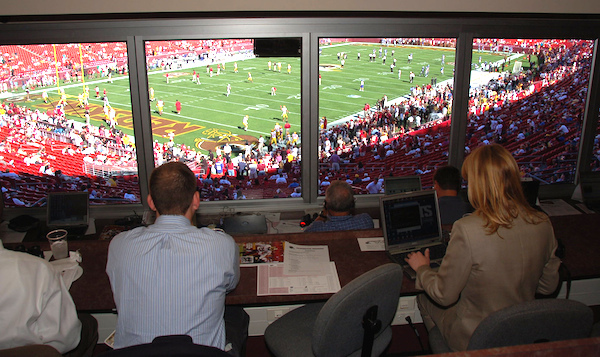 Photo of journalists working in the press box at FedEx Field by Scott Ableman used under a Creative Commons license. POSTED June 16, 2014, 10 a.m.
Lichterman, Joseph. "How do sports reporters at newspapers adapt to the Internet? Often, grudgingly." Nieman Journalism Lab. Nieman Foundation for Journalism at Harvard, 16 Jun. 2014. Web. 23 Apr. 2019. Lichterman, Joseph. "How do sports reporters at newspapers adapt to the Internet? Often, grudgingly." Nieman Journalism Lab. Last modified June 16, 2014. Accessed April 23, 2019. https://www.niemanlab.org/2014/06/how-do-sports-reporters-at-newspapers-adapt-to-the-internet-often-grudgingly/.